Koreans love their chickens. We deep fry them, steam them, boil them, and braise them. 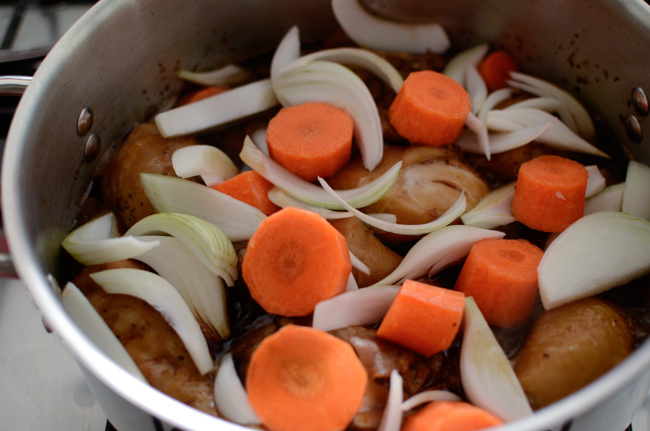 Out of all the cooking method, I love the braised chicken the best. You can’t beat the fall-apart tender meat that holds all the wonderful flavor underneath. 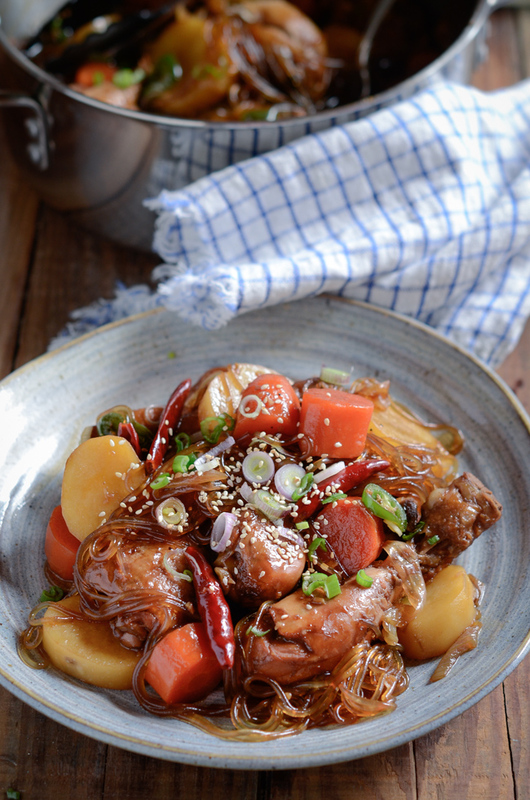 Here is one dish called Jjimdak (찜닭), the Korean braised chicken! It is a perfect dish to serve in the fall, although it doesn’t really matter and you can enjoy any time of the year. 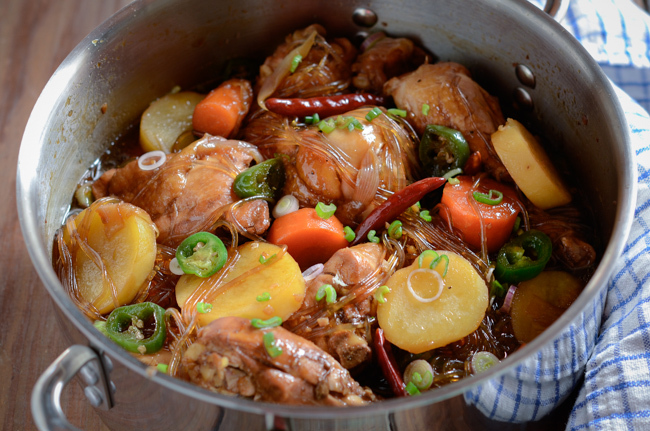 The chicken pieces are simmered in delicious sauce and cooked with onion, carrots, and potatoes. The addition of Korean sweet potato noodles (aka dangmyun, 당면) throws this dish up through the roof. 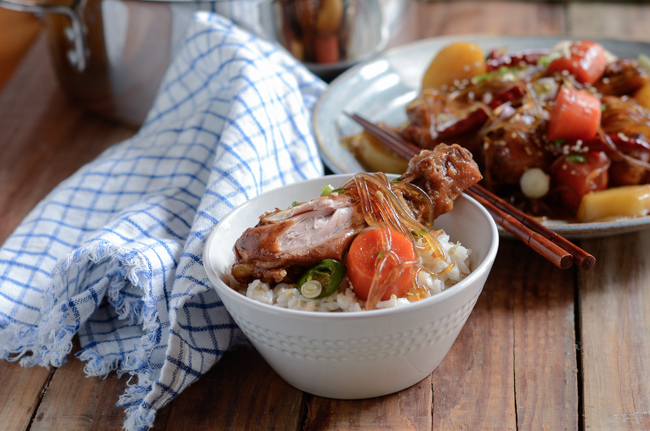 I made a similar dish, the Cola Braised Korean chicken, a few years ago, and this is a slightly different version. You will also find 2 unique ingredients that makes this Jjimdak extra special. Exciting~! 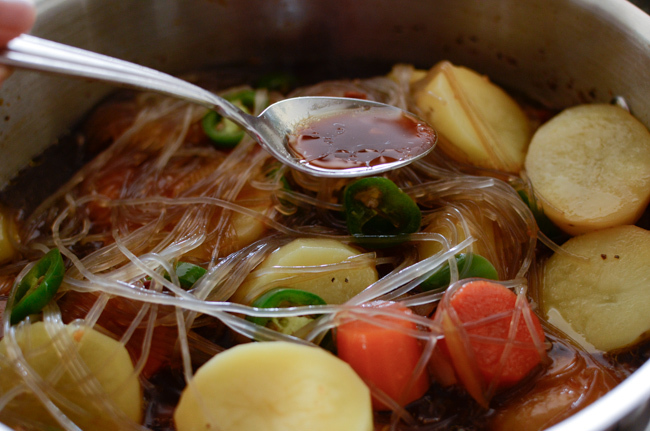 First thing you need to do… Soak your dangmyun (sweet potato noodles) in warm water. Set aside. You can find this noodles in any Korean grocery stores. Secondly… I would suggest to parboil the chicken for a few minutes. This will help to get rid of extra fat, and remove the gamy odor prior to the addition of the seasoning sauce. Remove the chicken and discard the water. Combine all the sauce ingredients. 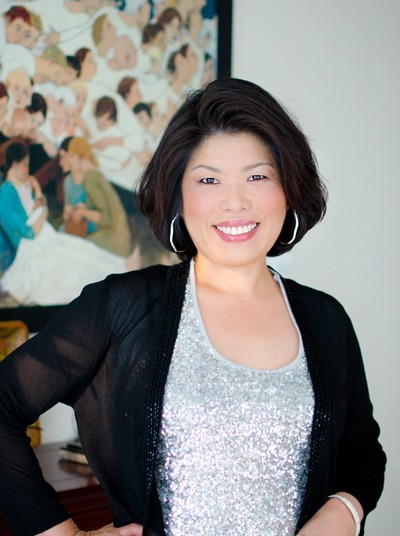 The two special ingredients that I mentioned early are…. dark brown sugar and cocoa powder! Trust me, you will love the flavor they make. 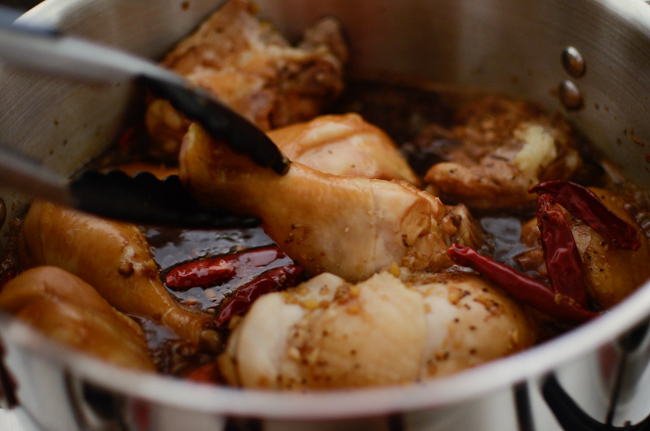 Pour over the chicken and throw some dried chili for the heat. Use however many chili you desire. I won’t stop you if you throw 20. Bring to a gentle boil, then turn your chicken to the other side. Cover and let them simmer for 20 minutes over low heat. Add the onion and carrot slices. Stir them well, cover, and continue to simmer for 10 minutes. Add potato slices and green chili (optional). You will want to raise the heat to medium-low. When the vegetables are tender, add the noodles… Don’t overcook the potatoes. Otherwise they will easily break and become muddy. Spoon up the sauce all over. Raise the heat to medium-high and bring the whole thing to gentle boil, uncovered. The noodles will only need about 3-5 minutes to cook. Done! Let the whole thing to sit for 5 minutes so the chicken, the vegetables, and the noodles can soak up the great flavor of the sauce. The chicken pieces are almost falling apart off the bone, the vegetables are tender, the noodles are so chewy…, oh, and the gravy? To die for. Typically, we like to serve this chicken with a little bit of rice to soak up all that tasty gravy. Just drizzle over rice and enjoy the goodness. This is a Korean fall comfort that I would like to offer you for free. Hope you like it! 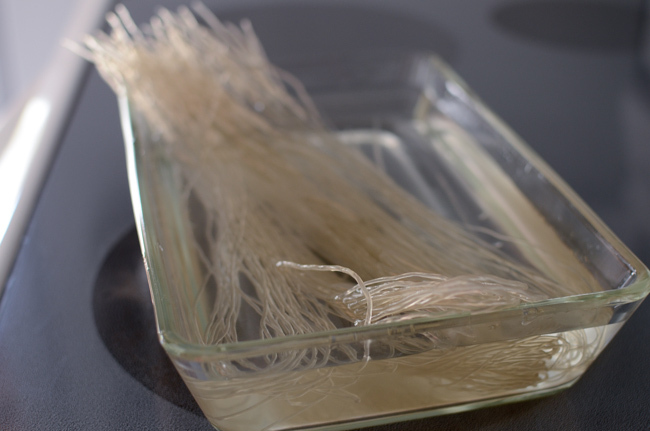 Soak the sweet potato noodles in warm water and set aside until ready to use. Place chicken in a pot and pour some water to cover the chicken. Bring it to full boil and cook for a few minutes. Remove the chicken and discard the water. 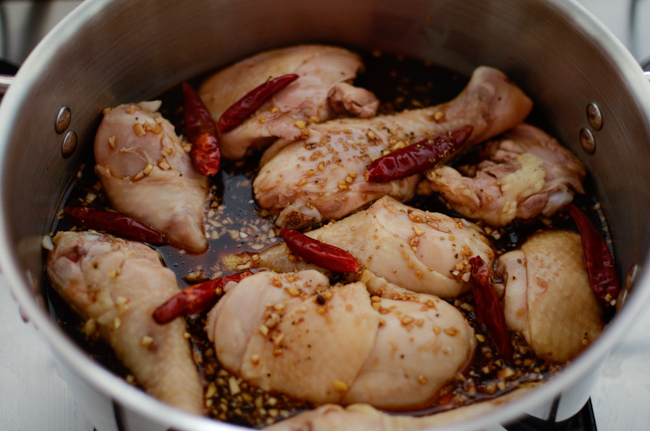 Return the chicken to the pot and add the dried chilies. 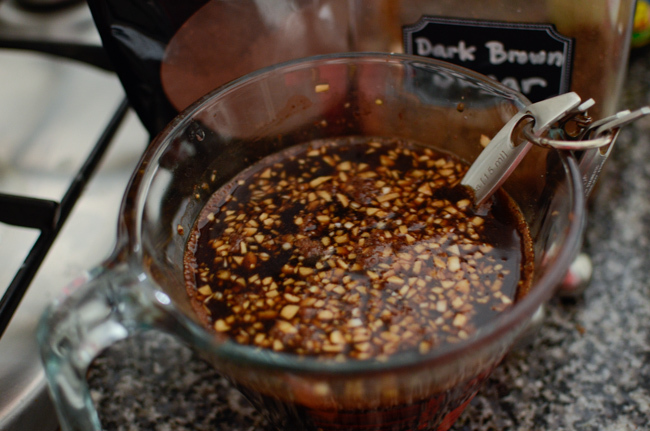 In a bowl, combine soy sauce, oyster sauce, water, garlic, ginger, sugar, cocoa powder, corn syrup, and pepper. Pour over the chicken and chilies. 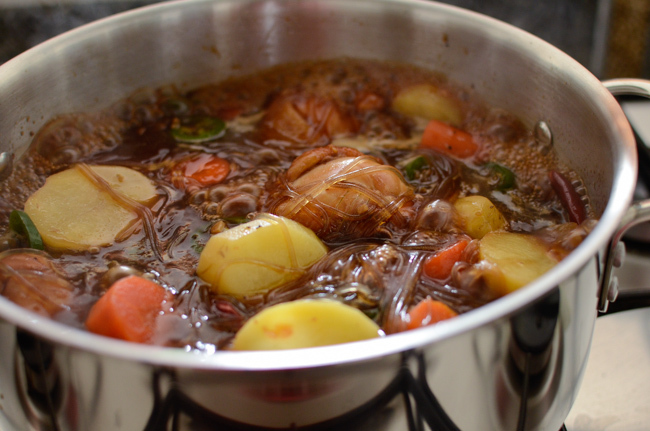 Bring the mixture to a gentle boil and simmer over medium-low heat for 20 minutes, covered. Add the onion and carrots to the pot and simmer for 10 minutes, covered. 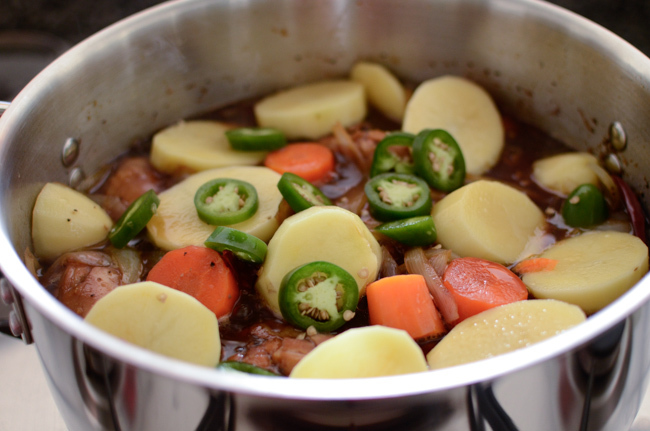 Add the potatoes and fresh chili, and cook until they are tender, about 10 minutes, with a lid half open. When the chicken and vegetables are tender, drain the noodles from the soaking water and add to the pot. 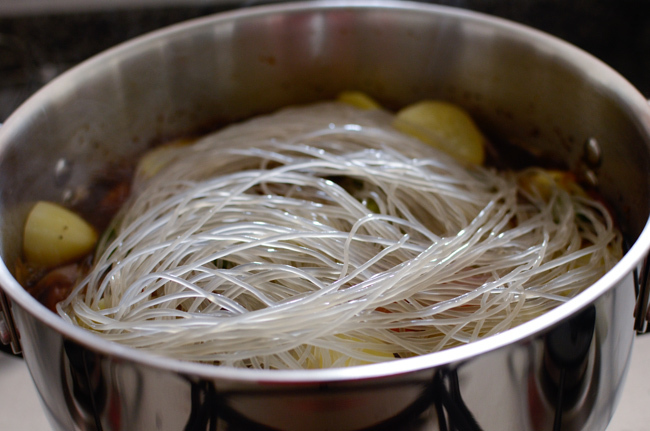 Raise the heat to medium-high and continue to cook until the noodles are tender yet chewy, about 3-5 minutes, uncovered. Remove the pot from the heat and let it sit for 5 minutes or so before you serve. Serve warm with rice. Cooler weather is on our doorstep, so I'm definitely thinking about comforting dishes. This looks perfect -- wonderful way to cook chicken. Thanks so much. Love love the sweet potato noodles so much. I bet it is quite yummy with the chicken soup. I made it for dinner tonight. The jimdak is SO, SO good! It is flavorful and rich. It is perfect comfort food. Thank you as always! Your recipes are the best! Thanks, Nancy. I am so happy that you liked it. I just got back from the Korean store for the for the dangmyun noodles. After searching for 20 minutes, the last pack I picked up was them! Now i've started the chicken and the sauce. 1 question though, it say's prep time is 10 hours? I might have missed a step, but am I supposed to marinate the chicken in the sauce? I'm so looking forward to this dish tonight, thank you!!! No, it meant to be 10 minutes. There is no marinating step. You can throw all the sauce ingredients in a pot and cook together. Hope you enjoyed it. This was an amazing dish, I can't wait to make it again! Thank you! I have a recipe similar to this but yours is way more amazing!! Looks like I have a new recipe for braised chicken. Thank you!! Thanks Grace. I am so happy to hear that you liked it. I made the braised chicken last night, and not only was it easy to make, it was delicious! The whole family loved them, will definitely make again. Thanks Holly! You are very welcome, Ed! Happy to hear that your family liked it. Holly, I got some drumsticks this afternoon and will try this recipe for tomorrow's supper. Thank you for taking the time to put this together! Can I add some sesame oil / sesame seeds to this? Seems like those would make it even more Korean. Of course you can. But not too much. You don't want the sesame oil to overpower the dish. I have no idea what I did wrong but my sauce evaporated and by the time I was done I had stick everything and no sauce :( Any ideas what I might have done wrong. I used boneless chicken but thats the only thing I did differently. Did you cover the lid when you are simmering the chicken? You only need to open the lid when you add the vegetables. Sorry to hear all the sauce has evaporated. I highly recommend to use boned chicken. 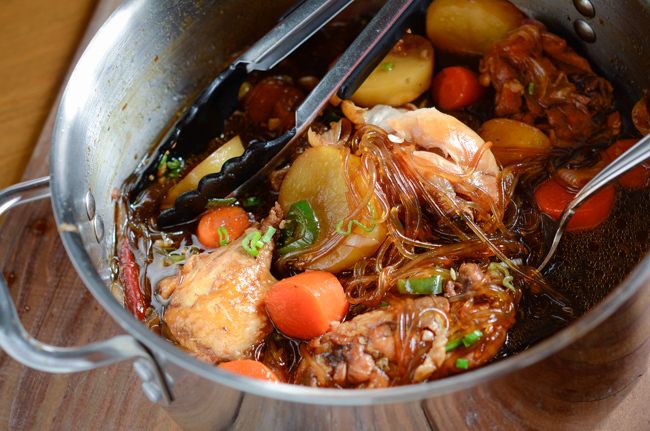 boneless chicken is not suitable for this type of braised dish. Hi there! Can I just check if I am supposed to fill the pot with water till it just covers the chicken after the parboil step (step 3), or is there a specific number of cups of water I need to fill? If so, how many cups? Thank you! No, there was no specific amount of water to fill the pot when you parboil the chicken. Just enough amount to cover. My grandpa was Japanese and would make something similar on special occasions, minus the chili’s. We’ve pieced the recipe together over the years and it’s close to what I remember. 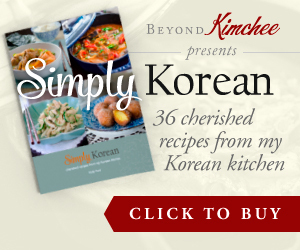 Who knew it was a Korean dish? But this recipe might just be the perfection, minus the chili’s. I find it best to cook the chicken in just enough water to cover for 20 minutes with a 1/4 cup of soy, then drain it all out. The fat can kill the dish. Dark meat seams to be the secret ingredient. But the noodles are really the main ingredient. This is definitely my comfort food. The noodles, potatoes, and rice might seem like a carb overload, but you gotta portion it right. Or just make it like a holiday dinner and enjoy all. And you can never have enough carrots. And don’t forget to add some mushrooms. Your choice.